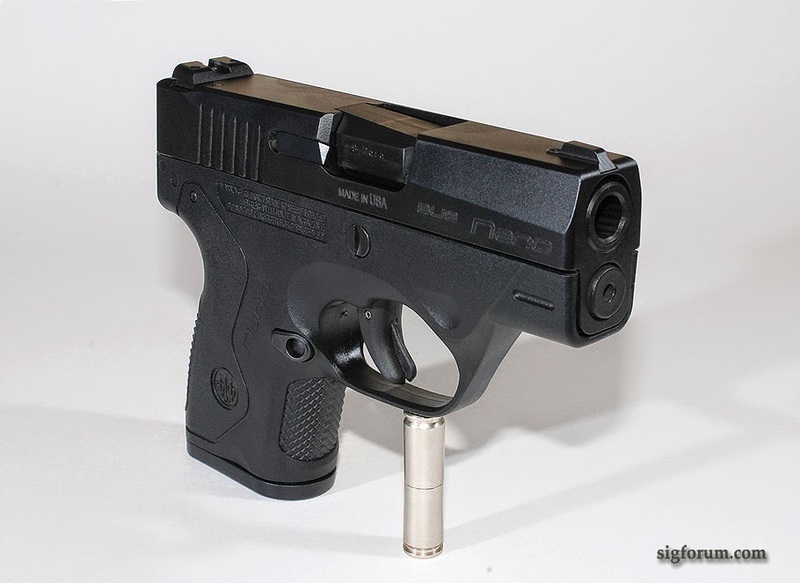 Fixing Grace : Beretta Nano Review, Part Deux. Beretta Nano Review, Part Deux. Finally, I got a chance to practice with the gun I've saved for months to get and even more months to get to shoot. I cycled 99 rounds through this piece, which amounts to about 14 magazines. All in all, the gun does what it's supposed to do, but some concerns remain. I will say that I'm not a pro or gun "expert" and in fact have only owned handguns for a couple years. Again, this is not a site for discussing whether or not citizens should not have guns. In the United States of America, this is a right and with that right comes responsibility. Never point a gun at anything or anyone you do not intend to destroy or end. Always treat a gun as if it were loaded and keep any and all firearms out of the hands of children and irresponsible adults. Use a safe backstop when practicing with firearms and make of what's beyond your intended target. Obey all laws concerning the sale, possession and use of any firearm. Again, 99 rounds isn't a whole lot for some, but considering the price of ammo it was more than enough. Even though I've heard that you should use a minimum of 124 grain ammo in this gun, the fact is that when I bought it, only 115 grain was available locally. I practiced with Lellier and Bellot as well as Federal Champion. The Nano ate the former without complaint, but the Federal Champion had two failures to eject out of 70 rounds, which I contribute more to ammo at this point. Since I carry 135 grain hollow points with this gun, there shouldn't be an issue with these. However, I'm getting ahead of myself. Aiming and firing the gun is easy enough. Despite the low profile sights, they were relatively easy to line up and with a firm grip, were quick to get back in line. The trigger pull is what I would in layman's terms is in stages. There's a half inch of slack, followed by another half to three quarter inch of tension terminated by a vague break. In contrast, my Ruger SR9c bang switch needs just a press to set it off. As with my PX4, it was still smooth. Unlike a lot of guns out there, the grips are small and not adjustable. Considering the price point of this gun, which was about $400, this could be an issue. Even though there is a magazine with an extension that comes with the gun (it did with mine) They aren't always available. What really surprised me was how little recoil this piece has when firing it. It needs a firm grip, but I never had the feeling it was snappy or had too much muzzle flip. Even with the low profile sights, follow up shots were easy to line up. With something as high centered as this gun is, that's an achievement. What will take time to achieve is some accuracy along with practice. This one was not accurate right out of the box. While you can adjust the sights with an Allen wrench, you also need to remember to bring the Allen wrench to be useful. As a result I found myself shooting low and to the right six to nine inches at 30 feet. Even my amateurish self can hit within six inches of the center of the target with the Ruger consistently. This is no fault of the gun, but a need to practice and familiarize myself with it and adjust it properly. It also means not carrying it until this is taken care of. With the Federal ammo, I had two malfunctions. Both were failures to eject. One where the round went up and down and the other with where it jammed behind another round. Both times a pull on the slide cleared it. A minor concern plinking at the farm could be a huge problem defending oneself at home or the street. I've heard in some circles this gun likes at least 124 grain ammo, but the manual doesn't specify. All it does make mention of is not to use submachine gun or reloaded ammo. Neither of these are a problem for me. However, when I can find something bigger than 115 grain that isn't a dollar a round, I'll try it again and see what it does. Even with that, the Lellier and Bellot fed through without an issue. As for the verdict, the jury is still out. The Nano is comfortable to shoot repeatedly without any drama. Although my hands are average sized, a woman would have no problem shooting or carrying this gun with relative ease. It disappears under a shirt and waistband. What needs to happen is practice, and often if you are going to defend your life with it. The trigger pull is long, and between that and it not always being accurate out of the box you will need more than an afternoon a year to dial this in. Plan on either bore sighting or burning some ammo and playing with the sights to get it spot on, or as much as a piece with a 2 inch barrel can get anyway. As always, I will follow up when I get another chance to shoot it, and I can't wait. Maranatha! Sodium Light Redux and Repurpose. G.E. Refrigerator Water Dispenser Issue. What is Going On Lately?